Drumheller is located 150 kilometre northwest of Calgary in Red Deer River Valley. It is a small town with about 6.300 inhabitants. Wrongfully Drumheller isn't well-known, even though it has an interesting history. The history of the Drumheller Valley began about 70 million years ago, when the land was flat and the climate tropically. This was the ideal surrounding for plants and animals and was home of the dinosaurs. Some million years ago the dinosaurs became extinct, but the remains were covered with sediments of the rivers and in this way preserved. During the ice age the entire region was covered with ice - at its thinnest still about 1000 metre thick. At the end of the ice age the glaciers melted away leaving lakes and the Drumheller Red Deer River Valley as it is know today. Soon it became the home for new animals, plants and the Native People. In the 1880's this region was discovered by J.B.Tyrrell, who was looking for coal deposits. 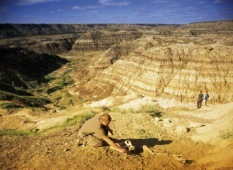 He came across a skull of a dinosaur, which today is known as the Albertasaurus. This finding was the beginning of the search for remains of this giant animals. The first inhabitant of the valley was Thomas Greentree who built his house in 1902 in the area which is today known as Drumheller. Sam Drumheller was the first, who exploited the rich coal deposits of the region. The valley was dotted with more than 40 mines and attracted new settlers, who came in hope of a better life. In 1913 the railway Calgary - Drumheller was opened and the coal industry was booming. When the coal was all mined and one mine after the other had to be closed there was found oil in the area, which presented a new boom for the region. 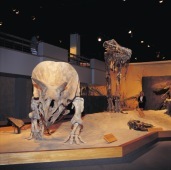 In 1985 the Tyrrell Museum opened its doors. Today it attracts many thousand visitors per year. The Royal Tyrrell Museum of Palaeontology is unique and offers the most extensive and exceptional displays of dinosaur skeleton of the world. It is a recognised research institute and offers interactive and explaining exhibits as well as explanations via audio and video. The museum is located 10 minutes north west of Drumheller on North Dinosaur Trail. The Dinosaur Trail is a 48 kilometre long loop (Hwy 838), which starts and ends in Drumheller. You can drive it in both directions. On your way you will see Alberta's famous Badlands, the Royal Tyrrell Museum as well as some view points at Orkney and Horsethief Canyon. Trails lead down to the canyons where you may discover petrified oyster beds. The Bleriot Ferry is one of the last cable operated ferries. The ferry was opened in 1913 and is located 27 kilometre north west of Drumheller. The service is free.